If you go to a restaurant in New England, you can usually order clam chowder one of two ways…thick or thin. Whether it is served in a cup, a bowl or sometimes in a bread bowl, it is always white and never, ever will it be tomato based as in other parts of the country. Little oyster crackers are traditionally served alongside to be used as a topping. You may be looking at the photograph and thinking that my chowder doesn’t look like what you have seen before. That is because I made mine with a twist. I used three kinds of potatoes…little red bliss, golden and purple ones. It might be considered scandalous to mess with tradition in this way but I wanted to add some color to this basically white chowder. Of course, you can follow tradition and prepare a totally white chowder or you can be adventurous and add a little color to your life by adding a variety of potatoes to this classic recipe…just don’t tell a New Englander that you are messing with tradition. Place diced bacon in a large pot and cook until the fat is rendered and bacon is starting to brown. Add the onion and celery and cook until they turn translucent. Then add the garlic and cook for an additional minute. Sprinkle in the flour, stir well and cook for about a minute more. Slowly pour in the clam broth, stir and let cook for several minutes. Add the diced potatoes**, bay leaves, thyme and enough water to completely cover the potatoes. Cook for about 10 or 15 minutes until the potatoes are tender. Add in the chopped clams and the cream. Cook until the clams are heated through and tender. Remove the bay leaves and thyme sprigs and taste for additional seasonings. * Ladle the hot and creamy soup into bowls and serve with oyster crackers on the side. *I have not added salt in this recipe as canned broths and canned clams, if using, have salt in them…some being very salty. I would rather add salt at the end of the cooking time if it is needed. **I cooked the purple potatoes separately and added them to the chowder right before serving. I didn’t want the chowder to possibly turn blue. That would be a little too untraditional. This is a thick and creamy chowder that can be served as a first course, along with a sandwich, a warm and hearty meal on a cold day, or part of a traditional New England clam bake in the middle of summer. No matter if you are making a couple of cups or a huge pot for a crowd, try to have the ratio of clams and potatoes about the same. Just remember that New England clam chowder never has tomatoes in it…you don’t want to mess with tradition too much. This entry was posted in Uncategorized and tagged clam chowder, Dinner, food, New England, New England clam chowder, Recipes, seafood, soup. Bookmark the permalink. My son was married in Providence a few years ago. Before the wedding, I accompanied him and his bride-to-be on a search for the best clam chowder (what a treat) as they wanted to serve it as an appetizer at their reception. Fortunately we loved the one at the Brown University Faculty Club best and that’s where their reception was being held!! I also found out that Rhode Island has it’s own version of clam chowder with a clear broth. It was good too. I love your twist with the colorful potatoes. Hi Bonnie, I know that Rhode Island clam chowder is made with a clear broth but I haven’t had it. Next time I head that way I must give it a try. I’m glad with the like my idea of using different potatoes. I like changing things up occasionally. Thank you for your nice comment. If I went to New England, I would certainly be one of these tourists 😉 I have never had any chowder in my life, not to mention the New England version. Your three-potato version looks fantastic! Hi Sissi, I do hope that you will get the chance to visit New England some day. If you do, you will definitely have to try the chowder and of course a lobster roll as well. I’m glad you like my three potato version. Thank you for your compliment. Hmm, it looks like “wicked good chowdah” but being a born & bred New Englander I know my family would look at it with a shifty eye! ;). That said, I’d love a bowl on this frosty morn! Hi Mary, I’m glad my born and bred New England friend thinks the “chowdah”is wicked good. Yes…I have messed with tradition and many will frown upon the potatoes I used. I had those pretty little potatoes and thought they would add color and fun to my normally white chowder. Thank you for your nice compliment. Fell in love with you chowder when I saw the photo of the finished chowder with the purple potato. Can you get red potato where you are (the interior is red)? If so, you can make a patriotic chowder on July Forth, how fun that would be to serve. Hi Norma, I’m glad you like my addition of the purple potatoes. I like the idea of a patriotic chowder for the 4th. Thank you for your nice compliment. Thanks for reminding me. Rich and lovely recipe. Hi Rosemary, A rich and creamy chowder is perfect when it is cold outside. It has been below freezing for almost a week. Clam chowder is my son’s favorite meal. I love your assortment of potatoes and so will he. I can’t wait to make this for him. Hi Karen, My husband and I love clam chowder. I enjoyed the color that the potatoes added to the dish…it was fun for a change. I hope your son will enjoy the chowder. Thank you for your nice comment. Looks like a terrific way to warm up on a cold January day. Mmmmm. Hi Rutheh, The chowder was a perfect meal for the bitter cold days we have been having this week. Thanks! Our daughters love this..I have a few recipes..one is a favorite.. I have even tried the very brothy ones from the Maritimes..and it was good also. Never saw purple:) Never too late to start..
Hi Monique, It seems that the different seacoast regions all have a variation on chowder. I’ve had the brothy ones and they are good but my favorite are the thicker ones. I think my chowder with the purple potatoes is probably a first. I’m always up to try something a little different. Thank you for your nice comment and have a lovely weekend as well. New England Clam Chowder is among my top 5 favorite foods. Unfortunately in Texas one is challenged to find it made properly………..and you are quite correct as soon as I get to New England I begin eating Clam Chowder, Lobster and buckets and buckets of Steamers. You have made me so hungry……..tonight I am making your recipe!!! I have to agree with you Emil, New England Clam Chowder is good. My husband loves the steamers as well. Enjoy your chowder this evening. Thank you for your nice comment. I am guilty of doing the same! I always seek out the traditional foods of an area and when the vacation is said and done, it’s the food we ate that I remember. I like your twist with the coloured potatoes, adds some vibrancy to an all white soup. Beautiful! Hi Nazneen. We do the same thing when we travel and enjoy whatever food the region is famous for. I’m glad you like my use of the different potatoes. Sometimes we all need a little extra color in our life. Thank you for your nice compliment. yum! What a dish for a cold day like this. I agree with you Kathy, we need all the warming meals we can get with the bitter cold weather. I’m glad you like the chowder, thank you. Great post. I am sharing this one on my Sassy Spoon site and on Facebook. Love the different potatoes. Thank you Devany, for your lovely compliment. I really do appreciate you sharing my post…that is very kind of you. We are on the same wave length, Karen. I just mentioned New England lobster rolls in my post this morning. I’m one of those people who would stand in line for a lobster roll no matter what time of year it was. We are big chowder fans and I love the bit of color the potatoes give your version. My recipe is similar to yours and we love it. Hi Cathy, I think anyone that visits New England leaves having had a lobster roll. Last year you could buy small lobsters for $3.99 a pound and everyone ate lobster like crazy. I’m glad you liked the color that the purple potatoes added to the chowder. Thank you for your nice comment. I don’t use a recipe though, so I will give them yours when they ask for one, minus the bay and thyme. How many does that serve? Have a good weekend! We got more snow last night and it is in the teens. Hi Kathleen, Thank you for stopping by for a visit and your nice comment. You will get about six cups of chowder, more or less. As you know it is very easy to adjust the recipe up or down. We have just been getting light dustings of snow lately but have six inches on the ground. It is supposed to get above freezing next week so we should have some melting. I hope you have a wonderful weekend as well. Oh, does this make my mouth water. You know, I don’t ever make it when I am in Houston and I’m not sure why that is. Great idea to add the different potatoes which give the chowder a sassy look! How are you faring the very cold weather? Hi Linda, I think when you are home in Texas that you probably enjoy all the regional ingredients. I’m glad you like the different potatoes…I thought it was a fun change of pace. We are both doing good but it certainly has been indoor weather lately…zero at night, teens and twenties in the day. What a delightful looking chowder! I can say that being from the South where our clam chowder would probably be non-traditional to a New Englander anyway. 🙂 Actually I love the touches of color and also that you used frozen clams. I feel like this chowder is very accessible for me to make, and I’d like to try it. Hi Betsy, Thank you for your nice compliment. I enjoyed using the pretty colored potatoes…different from just a bowl of plain white chowder. I hope you enjoy the chowder when you try it. Thank you Elizabeth, The chowder was as good as it looks. Oh my, I can almost taste this. Rich and comforting. Yum. Hi Victoria, I’m glad you like the chowder. It is a comforting meal for our very cold weather we are having now. The funny thing about it is that I love it just as much in the summer. Oh yes, please – do you ship (j)?? You know I crave lobster rolls… and clam chowdah just isn’t the same down here in central Texas – doctored up canned stuff is (sadly) about as good as it gets. Sigh… mmmmm…. Hi Rachel, Doctored up canned soup has to do sometimes when you can’t get the ingredients to make it fresh. I know that fresh made is best but I bet you know how to make any soup taste good. Even in central Texas, I bet you can get gulf shrimp. Chop some up and use them in my recipe and it will be terrific, I do it all the time. I simply LOVE New England Clam Chowder and so did my dad. I haven’t made it since he passed – I believe that’s something wonderful to do this weekend while it’s so doggone cold! Thanks for the recipe! Hi Kelli, I hope you enjoy the comforting warmth of the soup and have wonderful memories of you dad as you do. I know what you mean about the cold…the highs have only gotten to the teens and lower twenties here. Thank you for your nice comment. I like your twist…esp. with purple potatoes. Yum! Hi Angie, I’m glad you like the twist with the purple potatoes in my chowder. Thank you for your nice compliment. I am going to copy your recipe. I have never made clam chowder although I have ordered it in restaurants many times – I think my favorite so far was at the Grand Central Oyster Bar in the Grand Central Station in New York City. I went to NYC in October 2011 to show support and they had a special menu – I still remember it. Their chocolate mousse was to die for! Hi Vagabonde, I’m glad you like my chowder recipe. It is simple to make…I hope you will enjoy it. I’ve heard that the seafood at the Grand Central Oyster Bar is very good. I love clam chowder! Years ago we used to take vacations at Long Beach Island, New Jersey, and my wife and I want go up and down the island sampling the various clam chowders. Lots of fun, and such great food. Your version is a classic – I love it. I’m OK with the Manhattan clam chowder (with tomatoes), but the cream style is better. Have you ever had the clam chowder from Rocky Point Amusement Hall in Rhode Island (I think that’s the name of it – it’s been decades since I’ve been there)? They sere a Rhode Island clam chowder as part of their big shore dinner that actually does have tomatoes in it (in a thin broth – not like Manhattan), although that style isn’t characteristic of Rhode Island chowder as far as I know. Anyway, good post – thanks. Hi John, I’m glad that you enjoyed the post. It is so much fun to try chowders at different places to see if you can your favorite. I agree with you, I like the New England version better than Manhattan…not that it isn’t good. I have not been to the Rocky Point Amusement Hall in Rhode Island but I bet their shore dinner was great. I do know that their state’s version is a broth based chowder. I love my chowder thick and white (no tomato broth for me please) and I like to add leeks. I love the purple potatoes. They make the soup so pretty. And you are so right about vacationers. I loved to try chowder and lobster rolls (whenever I can get them fresh). Hi Bonnie, Yes, thick creamy white clam chowder is the best as far as I’m concerned, as well. I think the addition of leeks would be wonderful. I’m glad you liked the addition of the purple potatoes…they were a fun change of pace. There is nothing better than chowder and lobster rolls…I’m looking forward to our summer in Maine and lobster. Hi Judy, Aren’t purple potatoes fun…they do make a dish so colorful. I’m glad you like my chowder recipe. Thank you for your nice compliment. Your clam chowder looks so tasty, I love that you used 3 potatoes! Thank you Laura, I’m glad you like the chowder with the three varieties of potatoes. I appreciate your compliment. I agree with everyone here about the idea of using the 3 different potatoes, that’s a really great way to make it more interesting. I was always the chowda maker for parties but for some reason I haven’t made it in a long time. I’ve used the canned clams in mine but oh, the extra time & effort to cook up a nice batch of fresh clams to put in can be so worth the work – I don’t mince them, just toss the whole clam in. Of course when I serve it I make sure the majority of those clams happen to land in my own bowl. If you use the heavy cream, have you tried just leaving the flour out? I’ve never put flour in & it seems that the cream thickens things up just fine. I’m not crazy about the tomato based chowder either. It’s good, but not if you’re expecting this – my husband found out by mistakenly ordering Manhattan Clam Chowder although I’m sure it goes by many names. You’ve certainly presented the best of New England food in my opinion! Thank you Diane, for your very kind words. I really do appreciate your compliment. It isn’t necessary to use flour in the chowder if you use heavy cream but it is necessary if your use half and half or milk as it will keep the milk from curdling. Now that’s really interesting, thanks for that tip. I always go with the heavy cream – figure if you’re going to do it, go all out but just don’t have your cholesterol checked the next day. I agree that heavy cream will make a better chowder. Hi Boleyn, I had the wonderful three varieties of potatoes and thought they would add color to the dish. With all the grey days, snow and bitter cold, I thought we needed something a little fun. Luxury to have an access to this lovely seafood. Hi Sophia, It is wonderful to live in an area that has such wonderful fresh seafood. I try to take advantage of it when I can. I don’t have the Provincetown Seafood Cookbook and since Howard Mitcham’s death it is very hard to find at a reasonable price. But you never know when you will stumble across something like that at a sale at someones home. I won’t tell anyone about the potatoes 😉 I adore clam chowder and this one looks amazing. Hi Tanya, I’m glad you like the chowder…and thanks for not spreading the word about the potatoes. 🙂 Thank you for your compliment. Thank you Giovanna, for your nice compliment. I hope you will enjoy the recipe when you get a chance to make it. Clam Chowder .. I like very much, even if I don’t like to eat clams. Nothing I have cooked myself, but I had one really good one and that was in Portland. Excellent, but the service was poor and when we didn’t tip the waiter enough – in his opinion – he came after us out on the street, so that spoiled the chowder. Your chowder looks fantastic and I like the yellow plate you have served it in. Hi Viveka, I think people like clams in the chowder because they are usually chopped small. There are some rude people…sorry one ruined you experience of the chowder you had in Portland. I like the yellow bowl as well. They are from France and I got them at a charity auction. Hi Uru, This chowder is just what you thought. It is definitely rich and tasty…a New England favorite. Thank you for your nice compliment. Karen, what a fantastic looking bowl of “colorful” New England Clam Chowder! I love the way you “adapted” the traditional recipe by adding some delicious and healthy purple potatoes to your chowder. They certainly look very elegant in that creamy broth together with all the other delicious ingredients! I only ate Clam Chowder once and enjoyed it tremendously – now that you posted the wonderful recipe and pictures, I think I should ask my trusted fish monger to try to order some fresh clams for me – mussels are easy to find around here but not fresh clams. Hopefully he will be able to order some for me. Thanks fo posting the delicious recipe and have a wonderful weekend! Hi Andrea, Thank you for your lovely compliment…I’m glad you like my adaptation. If your fish monger can’t get you fresh clams, maybe he can get you frozen as lots of restaurants use them. Have a wonderful weekend as well with your family. Karen, I am happy tp report that my fish monger did manage to order some fresh clams for me – made the Chowder using your recipe but doubled it and all my guests agreed how delicious this Chowder was (told them all about your blog and the recipe). Thanks for posting this wonderful recipe! Have a great Thursday! Hi Andrea, I’m so happy to hear that your fish monger was able to get you fresh clams and that you made this dish for guests. Thank you for letting me know that everyone enjoyed the chowder…that is such a nice compliment. I appreciate that you have prepared so many of my recipes. Thank you! Love the different coloured potatoes in this chowder, Karen. The clam chowder is one of my happy foodie memories from a trip to Boston and I love the little crackers over the top. Hi Hester, I’m glad I brought back nice memories of your trip to Boston. It appears that everyone likes the different colored potatoes. It is fun to do something a little different sometimes…and yes, the crackers are very traditional. Hi Celia, I’m glad that you got to see what an oyster cracker looks like. No taste of oyster in them…actually it is a little plain cracker. I bet you have something very similar that people enjoy with soup. Thank you for your nice comment. When I visited the States four years ago I knew I should’ve travelled to New England (instead of Houston to visit a friend – wonderful to see her but really didn’t like Houston) as I love everything seafood. No point kicking myself as I can now cook a chowder, thanks to your post. Well, I’ll have to sub the clam broth (that won’t be available here) with chicken, I suppose. Hi Johnny, Houston is a big sprawling city…very different from New England. I hope you will get a chance to visit someday. Hi, Karen: We must be on the same wave length. I wrote a draft today about the cold weather and making N.E. fish chowder. Never thought to use colored potatoes, but I’d be willing to give it a try. Yours looks great! Hi Carolyn, Thank you for stopping by for a visit and your nice comment. I’m glad that you liked my chowder with the colored potatoes. With the bitter cold weather that we had this week, chowder is a warming meal. I like the blue potatoes! Thank you Chunklet, I did too. What a coincidence, I bought frozen clams yesterday! Now that is a coincidence, Tandy. We were both thinking about clams at the same time…enjoy! Hi Debra, The chowder is simple to make. I keep frozen clams in the freezer as they are handy when you want to put together a quick meal. I hope the two of enjoy the recipe. Thank you for your nice comment. Now that would be dangerously delicious on a winter day here in Brooklyn. Hi Michael, Thank you for stopping by for a visit. It seems we need all the help we can get to stay warm with the bitter temperatures lately. Thank you for your nice comment. Very Intresting with 3 differents Potatos Karen…I really like it!!! I’m glad you like the use of three different potatoes, Massi. Thank you for stopping by to visit and your nice compliment. Hi Mary, There is nothing quite as good as a lobster roll and a cup of clam chowder. I haven’t been down to the Cape and Nantucket in a couple of years. Hi Diane, I’m glad you like the clam chowder recipe. Yes, it is different with the three kinds of potatoes. I liked the additional color the potatoes added to the dish…the taste remained the same. Thank you for your nice compliment. Have a lovely week as well. Love mixing up chowder with the three different potatoes, especially the purple guys. Probably the most color chowder I’ve ever seen Karen. Hi Jed, I’m glad that you like my colorful chowder. During the drab days of winter, I think we need all the color we can get. Thank you for your nice compliment. Hi Mad Dog, I’m glad you like my version of clam chowder…it really is delicious. Karen I love your idea of using different coloured potatoes. I also love chowder but I have never had a bowl on New England clam chowder – definitely one for me to try. Hi B, I think you will enjoy New England clam chowder…whether it is plain white or with my colorful potatoes. Thank you for your nice compliment. Wow, sounds like a great soup for a cold winter day. And I love the purple potatoes! Hi Mary, Hearty and creamy clam chowder is a wonderful way to warm up your day when it is is cold outside. I’m glad you like the addition of the purple potatoes. Thank you for your nice compliment. Perfection, Karen, regardless of what color the potatoes are! There’s nothing like a good bowl of chowder, just like you’ve shared here. And, like any great chowder, there’s a nice bit of bacon to start if off. Clams and bacon were surely meant to be served together. Thanks for sharing another wonderful recipe. Hi John, When the weather is cold outside, there is nothing finer than a bowl of clam chowder. I totally agree…bacon and clams are terrific together. I’m glad you enjoyed the recipe and I appreciate your compliment. I’m all for colour in food. Apart from the health benefits of eating a variety of naturally coloured foods, it is just plain pretty, so I approve of your messing with a traditional dish. Hi Suzanne, I had to smile when you said you approved of my messing with this traditional recipe. It appears that everyone is in agreement about the three varieties of potatoes. I agree about the health benefits of including a variety of naturally colored foods in our diet. Thank you for your compliment. As I’m watching ice forming all over our windows, I’m thinking this chowda would be fantastic! 🙂 I like the touch of color too. Hi Kristy, It really does sound like you could use a bowl of chowder…I hope it warms up for you soon. I’m glad you liked the color the potatoes added. Thank you for your nice comment. Karen, I should not be looking at your recipes while on this three week detox program. My stomach is growling and would love to sample a bowl of this delicious soup. Let’s not even talk about lobster rolls. Hi Kathy, Once you are totally detoxed, I’m sure there is going to a long list of things you are going to want to eat. You will just have to add these to the list. I’d love to have real New England Clam Chowder. I had threatened to make it if the Patriots had made the Superbowl. I’ll save your recipe for when I’m feeling brave. Hi Lea Ann, No Patriots participating in the Superbowl this year…oh well. The recipe for my chowder is the real deal…just use plain potatoes. Hi Ladyfi, Warming and delicious. Thanks for your comment. You are right, I am one of those who’d never seen purple potatoes in a clam chowder. It looks beautiful, Karen! That is such a great take on the chowder. Have a good week ahead, Karen! Hi Ray, I think I created a first…I’m glad you like the looks of it. It is fun to be a little creative with your meals. I hope you have a wonderful week as well. A wonderful dish! I’d love to visit New England and eat chowder as well as lobster rolls. Hi Rosa, I hope you get a chance to visit New England some day…I think you would enjoy it. I’m glad you like the chowder. Hi Charlie, I agree…I don’t think I have ever heard anyone mention chowder that is from Australia. It is a good dish that I think you would enjoy. I’m glad you like the purple potatoes that I added. It looks hearty and so comforting and delicious. Thank you Pam, for stopping by for a visit and your nice compliment. New England clam chowder is a favorite in our home. NE clam chowder may well be my favorite soup. I’ve seen recipes without it, but I believe it must begin with bacon and we’ll try your recipe. Hi Larry, Don’t you just love the rich and hearty flavor of New England clam chowder. A lot of people use salt pork but I really like the use bacon. I use a thick applewood smoked bacon made in New Hampshire (Northwood) which was rated the best bacon in the US. It is so deliciously meaty and smoky that I don’t use as much as I would of regular bacon and it adds great flavor to any dish. I hope you will enjoy my recipe. What a beautiful chowder you created! I grew up on New England clam chowder (and lobster rolls) in Massachusetts and this brings back memories. You included a lovely variety of potatoes, too – the purple adds such nice color. Hi Hannah, I appreciate your nice compliment, especially coming from someone that grew up in Massachusetts. I’m glad you approve of my addition of a variety of potatoes. Sometimes we need a little color during the winter. Hi, I found you on blogspot through my friend Life in the Charente, you commented under her post Casablanca. I am saucysiciliana.blogspot.com, in case you are interested in pictures of Trapani, Sicily:) I am Sicilian but I grew up in New York. Would you believe in all those years I never had clam chowder? I don’t like seafood so will look through your other food…I see you have lots of recipes. Hi Francesca, It is nice to meet a friend of Diane…welcome. I can believe that you never had chowder growing up in New York, especially if you don’t like seafood. I do have a lot of recipes…all original. I hope you will enjoy spending time visiting my blog. Thank you for your comment. Hi Wendy, I’m glad you like my chowder. I agree with you, I like New England’s version better than Manhattan’s red chowder. Thank you for your compliment. I’m a huge fan of red & purple potatoes (and messing around with traditional recipes). Can’t wait to give this one a try! Hi April, I’m happy that you stopped by for a visit. I’m glad you like the use of a variety of potatoes in the chowder. Thank you for your comment and I hope you will enjoy the chowder. I love using Wondra too. Great tip! I can’t eat clams, but this looks yummy and comforting. Hi Ashley, I use Wondra all the time. If you can eat other seafood, you could substitute it for clams in the recipe. Hi Liz, Thank you for your nice compliment. I do love using Wondra. I use it all the time as it does eliminate lumps. We are big chowder fans here. (And there aren’t enough lobster rolls in the world sate me). I love using the different potatoes. It’s January in Minnesota. I don’t need to come indoors and looks at my dinner plate and just see of sea of white! Hi Claudia, Thank you for stopping by for a visit and your nice comment. I’m glad you like the variety of potatoes. Yes…when it is white outside a little color at the table is nice as far as I’m concerned. Such a classically delicious meal! Just can’t go wrong with a bowl of this! Hi Joanne, New England clam chowder truly is a classic soup. Perfect for the weather we have been having lately. Thank you for your comment. 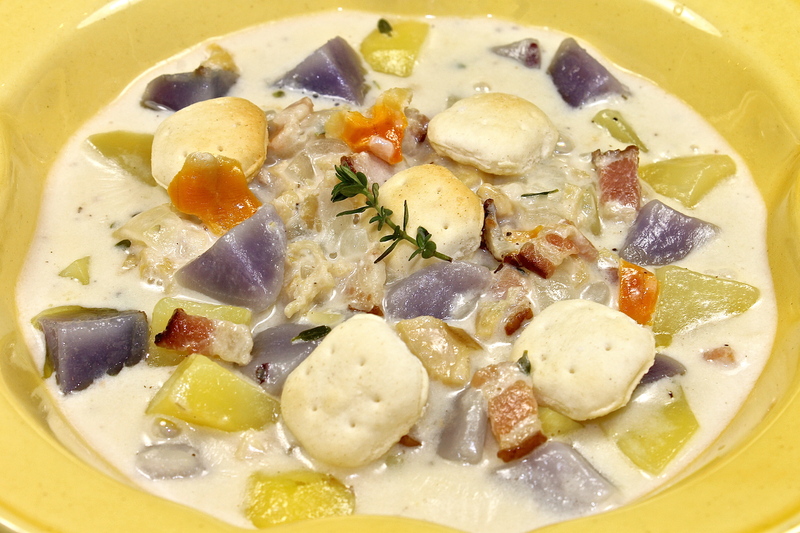 I’ve never actually tasted clam chowder, but it looks so good, and I love purple potatoes, they add so much color to each dish! Hi Gourmantine, I think you should definitely try clam chowder…it is one of the most well known and loved dishes in New England. Thank you for your visit and nice comment. What a gorgeous chowder! It sounds wonderful. Thank you Beth, for your lovely compliment…I’m glad you like the chowder. Hi Susan, I’m glad you are a New England clam chowder lover…I agree it is much better than the red stuff. Thank you for your nice compliment. I love clam chowder and I am sure that I would love this version. Have a wonderful week Karen! Hi Juliana, I’m glad you like the use of the three potatoes and the recipe for the clam chowder. Thank you for your lovely compliment and wish. I hope you have a great week as well. Thank you Raymond for your nice compliment…I’m glad you like that I added the purple potatoes. It is nice to know that you have the availability of clams in NZ…your seafood is all so wonderful. Hi Jessica, I’m like you and do enjoy more than one serving occasionally. Thank you for your nice compliment. I like the injection of color that the purple potatoes give. Nothing better than a big bowl of chowder on a wicked cold night. Hi Carolyn, I thought the variety of colored potatoes was a nice change for a normally white chowder. During the winter months when everything is white with snow outside…it just seemed like a fun thing to do. Thank you for your nice compliment. I really miss clam chowder from when we were still living in RI. My favorite clam shack in Narragansett went out of business (switched hands) many years ago and I managed to get the recipe from the cook before hand, very luckily! I will have to share the recipe on my blog sometime soon, that is if I can find any clams in Germany! Hi Laura, I know that when you move…you always miss some of your favorite foods that you learned to love. I still miss the good Mexican food that I enjoyed when I lived in Texas. Is your recipe for the R.I. chowder with a clear broth? I have another blogger from Germany that is checking to see if there fish monger can get her clams. Perhaps you might be able to find frozen or canned clams for your chowder. I confess to never being a huge fan of clam chowder. I tried some one our visit to Maine and I think the clams hadn’t been cleaned well as it was gritty – with sand. I’ll have to get over that and give this a try! Hi Jerry, I can so relate to sand ruining a seafood dish. When I lived in Florida, I gave up eating scallops at restaurants because they were not properly cleaned. One bite of sand and I don’t want to continue. If you go to my post Fregula Con Vongole you will see how I purge the clams of sand. They can also be rinsed again after chopping. Ok, I lived in New England but, and this is very unfortunate, I never tried either! This is so sad, especially as I look at this yummy chowder you made! I think I must pay NH a visit to remember my college days and try the chowder and the rolls! Oh my goodness Katerina, I can’t believe you didn’t try clam chowder or lobster rolls while living in New England. I hope you do get a chance to return to New Hampshire and get to try these famous classics. Yummy. Clams have a ton of B12, something I’m trying to eat more of. This sounds like a perfectly decadent way to get my dose. Hi France, I have to agree with you about this being a great and delicious way to get you B12. Thank you for your comment. I adore your take on chowder. Color is everything! And it must have been delicious! Hi LL, Thank you for stopping by for a visit and your nice compliment. I’m glad you like the variety of colored potatoes and the recipe. Everyone loves a good scandal, Karen! I absolutely love the colors in your chowder. I mean, clam chowder is awesome, but i can be pretty depressing to look at. You’ve made it as fun to look at as to eat! Hi Meg, I’m glad that you agree about New England clam chowder being better than the tomato based chowders. And oyster crackers…they do go so well. Thank you for your comment. What a lovely compliment, Nami. I have never had SF clam chowder but I’m glad that you like my recipe. I appreciate you nice comment. Hi Karpise, I’m glad that you like the idea of the different potatoes in the chowder. Thank you for stopping by and you nice comment. Wow! If the Mention of $5 Lobster rolls stole my heart, then Clam Chowder could be my other love. My mum actually makes an amazing seafood chowder (with sweet corn) kinda Asian style. I rarely eat a seafood based soup but I’ve heard of ‘Clam Chowder’ of course and your multi colored variety looks very moreish and creamy nonetheless! Hi Alli, The price of lobster last year was great…it will be interesting to so what it will be this summer. I’m sure I would enjoy your mother’s seafood chowder with sweet corn. Thank you for your nice compliment, I appreciate it as usual. Love that soup and today is a good day for it. Thank you Donna, for your nice compliment. I do enjoy chowder this time of the year as well. Unfortunately, I am not allowed creamed soups for health reasons, but I do sneak them in on occasion. I am not a big fan of clam chowder (sorry!) but I love the purple potatoes. Hi Ducky, Not everyone likes the same thing…so I understand that you aren’t a fan of clam chowder. What I do know is that I always appreciate your comments…thank you for being a loyal reader of my blog. Looks lovely. I had no idea you could get canned clams..
Hi Lacey, I find minced, chopped and whole baby clams and clam juice in the aisle where you would find canned tuna, anchovies, etc. Hi Trang, Our market just started carrying the purple potatoes. It was fun using them in the normally white chowder…I’m glad you like the looks of it. New England clam chowder is a favorite of mine. Thank you for your nice compliment. Thank you Terra for your visit and your lovely compliment. Even though I love clam chowder, as you said the white color can be boring. It was fun to make it a little more interesting with the different varieties of potatoes, especially the purple ones. Mmmm. A huge favourite of my boys. I made your recipe tonight! Thanks!!! Hi Trina, I always enjoy hearing from a reader that has made one of my recipes. Thank you so much for letting me know that you tried my chowder recipe and enjoyed it. I appreciate your comment. Perfect karen, and why not play a little with the colour? I’m sure teh different kinds of potatoes give the dish some extra flavours. Hi Claire, I’m glad you like the chowder with the colorful variety of potatoes. It was delicious and was more fun than just plain white chowder…especially on a cold snowy night. scandalous indeed!! but I like your colorful twist on tradition! Hi Carol, I knew my New England readers might think this recipe was a little scandalous but it was fun. Glad you like the twist…thanks.